What is Your Talent Sourcing ROI? Anything worth doing is worth measuring, and sourcing isn’t exempt from this. If you want to know which method of sourcing has the highest ROI in terms of enabling a person to find more of the right people more quickly, then you’re in luck – because that’s what this post is about. Human capital data comes in many forms – resumes, social network profiles, blogs, bios, press resleases, etc. – and I have found that a key and critical aspect of sources of human capital data that many people fail to formally recognize is the depth and completeness of the data that can yield information through review and analysis. Data is the lowest level of abstraction from which information can be derived. For data to become information, it must be interpreted and take on a meaning. Generally, the quality and amount of information that can be gleaned from any particular source is directly linked and limited to the quality and amount of data present to be reviewed and analyzed. How useful is an information system supported by only a small amount of limited data? Resumes typically represent the deepest source of human capital data. While the accuracy of them can be argued (albeit no differently than social media profiles) – most resumes contain significant and specifically professional information about the people who wrote them. LinkedIn is the one stand-out social networking application that has a decent number of profiles with deep human capital data. Although not a resume database, you can typically find (and thus search for and target) more employment qualification-related information than anywhere else outside of an actual resume database. While LinkedIn calls them “profiles,” and some contain very little information other than 1 title and 1 employer, some LinkedIn users fill their profiles out just as they would their resume. In fact, with the employment market in relatively bad shape, there are a number of articles advising job seekers to do exactly that – fill out their profile as they would a resume. And now, LinkedIn even offers the ability to convert your LinkedIn profile into a resume(fantastic move, by the way!). It also doesn’t hurt that LinkedIn has a robust search interface, supporting full Boolean logic as well as a number of LinkedIn-specific advanced search operators. Great search interface + deep human capital data = highly leveragable information system for talent identification. Of course, it can’t be overlooked that there are more incomplete and shallow LinkedIn profiles than there are complete and fully fleshed out profiles, so all is not perfect in LinkedIn land. Additionally, while LinkedIn has started to add some more specific location options for people to select (for example, my zip code gives me the option to select Alpharetta or Atlanta), many people still use their major metro area as the location on their profile (I do). What About Facebook, Twitter, and Google+? While many people in the recruiting and staffing industry get REALLY excited about Facebook, Google+ and Twitter – I don’t. Before you recoil in absolute horror that I haven’t jumped on the bandwagon with everyone else, let me say that I’m a big fan of leveraging any/all social networking sites (provided your target talent uses them to a good degree, of course). Yes, I they’re cool, and yes, I use them. However, I refuse to get so blinded by their perceived potential and the hype in the sourcing/recruiting community that I fail to see their limitations. You can certainly use Twitter, Google+ and Facebook to identify and contact potential candidates – there’s no arguing that. While Twitter is highly searchable, supporting Boolean queries and their own set of advanced search operators, Facebook isn’t (although it does offer you access to the largest single repository of people on the planet), and Google+ isn’t nearly as searchable as it should be given that it’s a Google creation. However, regardless of “searchability,” none of those sites offers much professional data about the people who use them, or at least not the right types of information that can help a sourcer or recruiter gain any significant insight into specific skills, experience (including precise responsibilities and capability as well as overall years and career progression), and specific location. You might get lucky to see a title on Facebook, Twitter, or Google+, and you might find people talking about their line of work, but the people who do mention titles and in some cases even employers is the vast minority. Lastly – when it comes to social networking sites like Google+, Facebook, and Twitter, even when people do mention something work related online that can enable you to try to guess what it is they do, in many cases they do so using non-standard terminology, which poses an additional challenge to talent identification. Facebook, Twitter and Google+ can be effectively leveraged for employer and recruiter branding, marketing, online community development, and socializing job opportunies (that’s social media speak for “job posting”) – which are largely passive methods of talent attraction. However, as shallow sources of human capital data, Facebook, Twitter and Google+ are not particularly effective for active candidate identification. When I say “active candidate identification,” I’m not referral to job seeking status (people actively seeking employment) – I’m referring to the process of actively searching for and identifying candidates with specific experience and qualifications that are highly likely to match specific hiring needs. Posting jobs is a passive method of identifying potential candidates, because you post the job and then sit and wait for people to do the work of identifying themselves. There is no doubt you can find and contact LOADS of people using Facebook, Twitter and Google+. However, in most cases, you have no real idea how much and exactly what kind of experience these people have prior to contacting them, and in many cases, you don’t know precisely where they live. Just because they list that they have their CPA, or that they belong to a nursing association, or they are a “fan” of a PHP developer page – it certainly does not guarantee you of anything beyond that. Using Internet search engines such as Google, Bing, Blekko, et al, to search for and sift through human capital data can definitely produce results. I won’t argue that. However, once you go beyond resumes (the deepest sources of human capital data), you quickly enter the shallow end of the human capital data pool – press releases, blog posts and comments, articles, etc. I would never suggest that these shallow data sources can’t be leveraged for sourcing and recruiting – but my point is that the intrinsic probability that any particular non-resume search result is qualified for your hiring needs is LOW. This is because less data means less information available to be gleaned about the potential candidate – leaving us with little to no idea as to their professional experience and qualifications, and even specific location in many cases. Maybe some sourcers and recruiters like to find and contact lots of people because they get paid to just be social and make lots of friends online. Maybe some companies think it’s productive and cost effective to sift through and contact large quantities of people who aren’t qualified for, would not be interested in, and/or would not commute (or relo!) to the opportunity they are being sourced/identified for. I certainly don’t! Who does anyway? Wait – please don’t raise your hand (not you – that other person). As shallow sources of information, Facebook, Twitter, Google+ and practically all sources of non-resume human capital data on the Internet simply don’t have much professional-experience/qualification-relevant information. Less and incomplete data doesn’t really make for a heavily leverageable information system. At least not when it comes to talent identification where it’s more than helpful to know a little bit about someone’s experience before you contact them. Candidates generally appreciate being contacted for opportunities that are in their “ballpark” when it comes to location and responsibilities. Most candidates don’t appreciate being contacted for opportunities that aren’t. Think about this for a second – what VALUE are you providing to people that you find and contact using shallow sources of human capital data when they are in fact not even remotely qualified or interested in your opportunity? Most people don’t appreciate being contacted by recruiters only to end up being used as a tool in your networking/referral recruiting efforts because you didn’t have enough information about them to possibly provide anything of value to them. Yes, I remember the days of just picking up the phone and calling people with little to no information – but take a second to answer this question: Is this kind of practice and process the best and highest ROI method of sourcing and recruiting?I think not. Deeper and more detailed human capital data enables more precise and controlled searches, allowing sourcers and recruiters to be able to make an educated decision to contact people based on capability and experience rather than blind faith or a guess based on perhaps a title alone. With resumes or fully fleshed out LinkedIn profiles, a talented sourcer or recruiter can effectively control critical candidate variables such as location, potential opportunity match, and experience/capability – including years of experience, which can tie into compensation. Sourcing Test: Which Person is More Likely to be Interested and Qualified? 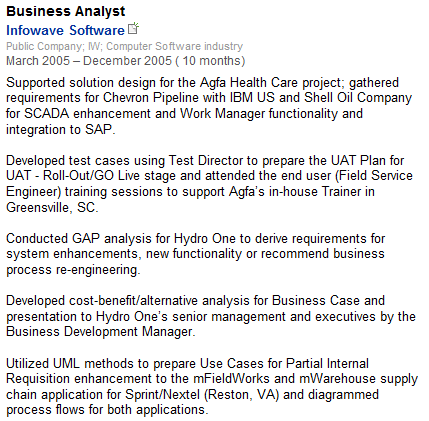 Here is a dramatic and certainly more practical example of deep vs. shallow human capital data: If you were responsible for filling a position for a Business Analyst with energy industry experience and specific experience working on SAP projects and using UML, which of the following people has the higher probability of being both qualified and interested in your opportunity? The LinkedIn profile is essentially filled out as completely as a resume would be, and as such, we can feel confident when contacting this person because their experience appears to closely align with our opportunity, and even if they aren’t recruitable, they’ll have to admit the opportunity was relevant. The Twitter profile mentions the title of “Business Analyst,” but little else – we have no idea as to this person’s industry or project experience. While we can cross reference the Twitter Bio with LinkedIn, when doing so, we can see by looking at her profile that she does not appear to have any energy industry experience, and we cannot tell if she has any SAP project or UML experience. If you had a choice between using either an information system that had shallow data on the people contained within, or an information system that had deep data on the people contained within – and you could only choose one – which would you choose and why? I know which one I would choose – all things being equal, I would choose the information system with the deep and more complete human capital data. That way, I can run creative and effective queries to search for, find, and contact people based on specific experience and qualifications. Why would anyone choose any different? You can find and hire people by searching any source of human capital data – resume or otherwise. However, searching Facebook, Twitter, Google+, blogs, the Internet and other similarly shallow sources of human capital data requires a higher amount of effort for a smaller return – what I call low yield sourcing and recruiting. While there is undoubtedly more shallow human capital data than deep human capital data, does it sound like a good idea to go out of your way to focus on low yield sourcing and recruiting? 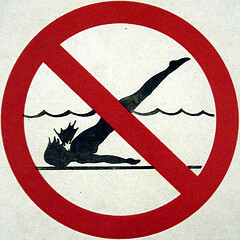 When it comes to proactive candidate sourcing (e.g., searching for people and not posting jobs and waiting for responses), I’d argue that the deep sources of human capital data such as resume databases, applicant tracking systems, LinkedIn, and Internet resumes are responsible for producing 80% of the search based sourcing and recruiting results (hires). Does your employer give you a choice?